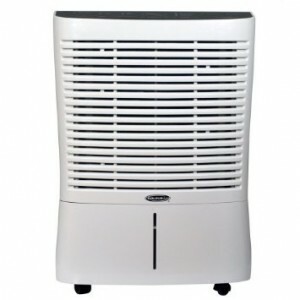 Soleus - Home Comfort : Dehumidifier Review • The Air Geeks, reviews of air conditioners, dehumidifiers and air purifiers. The #BDA95 is a strong dehumidifier that is capable of pulling up to 95 pints of moisture from the air per day. This humidity control system offers an adjustable digital humidistat and a programmable timer. Furthermore, it offers an automatic defrost control and 3 fan speeds. In case you are looking for a dehumidifier that will help you to create a comfortable environment in your home, then you need to consider this unit. In case you have already identified this dehumidifier as a suitable option and you are looking for information about its performance and features, then we are glad to tell you that you have come to the right place. To enable you to make a well informed decision, we have gathered reliable information about its performance. In addition, we have gone an extra mile and researched about its strengths and weaknesses. We hope that the details we have gathered will enable you to determine whether this is the right solution for your dehumidification needs or not. Have you been struggling to control the relative humidity of your medium or large room and you are looking for a strong dehumidifier? The #BDA95 is a high capacity humidity control system that offers a dehumidification capacity of 95 pints per day. This unit features an adjustable digital humidistat that enables users to regulate the amount of air in the moisture with ease. A side show by Soleus! 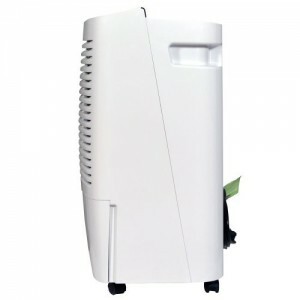 This features-rich dehumidifier offers three fan speeds and three preset dehumidifying modes. It also offers an automatic defrost function that prevents the building up of frost when the temperatures are low. With this unit in your house, you will be able to create an environment that is unsuitable for the growth of mold and mildew. It also helps to protect your possessions from the effects of excess moisture. The #BDA95 features an easily accessible bucket for holding the captured water. Its bucket-full indicator enables the user to know when the reservoir is full. 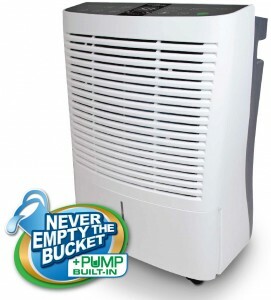 In high humidity areas, this dehumidifier can fill the tank several times in a day. The tank emptying process can therefore be a tedious task. In such environments, the best thing to do is to use a garden hose to drain the condensate under gravity. This mode allows continuous drainage thereby enabling the system to run for many days without requiring user’s attention. The “never empty the bucket” catch phrase! The #BDA95 offers three different modes thereby allowing you to select the option that is best suited for your dehumidification needs. The user can select living space, sleeping space, or basement. Alternatively, the unit allows the user to adjust the settings manually. In case you are looking for a unit that you can use in multiple rooms, then this dehumidifier is a suitable option. Its caster wheels enable the user to move it from one room to another with convenience. Although this unit is capable of pulling a lot of moisture from the air within a short time, we have noted that it deserves a bigger bucket. In high humidity environments, this dehumidifier can fill its small container up to 9 times. It is a cumbersome task to empty the bucket manually. For a high capacity unit that pulls a lot of water from the air within a short time, a pumping mechanism is a necessary feature. This dehumidifier does not feature a pump and it is therefore not a suitable choice for use in basements or other places where the condensate cannot flow under gravity. Effective dehumidification. This unit pulls a lot of water from the air within a short time. It is suitable for medium and relatively large rooms. Does not consume a lot of power. This unit consumes 750W. Compared to other units of same dehumidification capacity, this unit consumes less power. i. Features a tiny reservoir. This dehumidifier features a small bucket (10.6 pints). Considering that it offers a dehumidification capacity of 95 pints per day, it deserves a bigger bucket. Dehumidifier lacks a pump. Considering that there are cases where the condensate cannot flow under gravity, a high capacity unit like this one requires an inbuilt pump. Relatively loud. This unit produces a loud sound and it is therefore not the best option for use in quiet places. Bucket capacity: For the Soleus, you’ll want to use the hose attachment and a floor drain unless you’re going to be home and available 24/7. If operating at full capacity, you’ll need to empty the bucket 9 times per day. It says so in the owner’s manual. Plan on using the hose. Noise level: With the fan on high, the Soleus is louder than my 18 year old furnace and central air unit. Taking the fan down to medium makes the noise more manageable – similar to the Frigidaire on high. Energy usage: With my basement’s humidity level already at 50%, I plugged in my power meter (Kill A Watt), first to my Frigidaire, then to the Soleus, both set at 50% humidity, fans on high, and left them there for 24 hours. I live in southern Wisconsin, the outside temp and humidity were the close to the same both days. The meter showed that the Frigidaire costs $1.10/day to maintain 50% humidity, the Soleus $1.38. Opening the box took no time at all. This is quite heavy, and I recommend attaching the coasters before transporting it. I set it up in section of our unfinished basement where tends to be quite a bit of moisturet. Once I set it into place, I experimented with the various settings. This is a 95 pint dehumidifier with an 16.9 pint capacity bucket. Compared to other dehumidifiers that I own, I find this one to be very intuitive to operate and it’s much quieter than average. The control panel is organized well and has indicator lights for useful information such as “Bucket full” and “Clean Filter”. The indicator light for the fan speed shows High, Medium, and Low. A feature that I don’t see in many models is the Child Lock feature. There are side handles for easier lifting but I prefer pushing this unit personally. There are 4 major settings: Sleeping space, living space, basement and continuous. The built in Humidistat shows the current room’s humidity and the current humidity setting. I tend to keep the humidity lower in the unfinished basement section since I don’t need mold damaging the items stored. Operation is simple, and removal of the bucket is easy without spillage. The sound is tolerable; however, since it’s not in a living space, I don’t hear it at all. I do tend to keep it on medium fan speed. Removal of the filter and cleaning is simple. There is an option for using a hose, with an included adapter which eliminates one daily step of emptying the bucket when full. However, removal of the bucket is easy and it doesn’t spill. The #BDA95 is a powerful unit that draws a lot of moisture from the air within a short time. In high humidity places, this unit can fill its small tank up to 9 times in a day. Despite the effective capacity offered by this dehumidifier, we have observed that it lacks a necessary feature: a pump. It is therefore not a suitable option for basements or other places where the condensate cannot flow under gravity. The unit also deserves a bigger tank. At the Air Geeks, we are not fans of this unit.